NOCCA’s “new” Steinway piano pictured in it’s original home in Berne, Switzerland. Did you know the grand piano used at the Vernon And District Performing Arts Centre is owned by the North Okanagan Community Concert Association (NOCCA)? 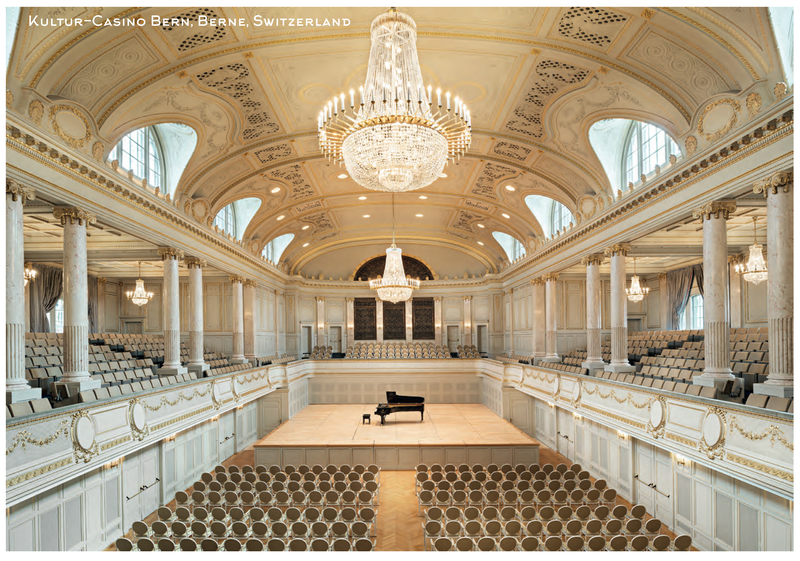 The “new to us” fully restored 1978 Hamburg Steinway saw its first concert in the Kultur Casino Saal, Berne, in Switzerland. During its time as a concert piano, its keys were caressed by pianists Maurizio Pollini, Martha Argerich, Edith Wiens, Elizabeth Leonskaya and Tatiyana Nikolayeva. In 1988, the piano was purchased by Thierry Gudel, a concert pianist who brought the piano with him to Canada when he moved here in 1995. After making a personal decision to downsize his residence, Mr. Gudel informed Verhnjak Pianos in White Rock that he no longer had room for his Steinway and requested them to find a buyer. Rod Verhnkak, knowing that NOCCA was in the market for a concert grand, contacted us and the rest is, as they say, musical history. After several technicians’ reports, as well as gracious playing by Ian Parker and Sarah Hagen, NOCCA made the decision to purchase the piano and proceed with the necessary refurbishing. The piano was officially purchased from Mr. Gudel in January 2015. The piano has been restored by Verhnjak Pianos of White Rock, BC, a firm with an excellent reputation of rebuilding pianos for more than forty years. We opened our 2016 – 2017 season with the ‘new’ Steinway played by Ian Parker, who introduced this beautiful instrument to us in a stunning performance. NOCCA extends a sincere “thank you” to all the members, artists and donors who have contributed their support in bringing this new musical voice to our stage. We look forward to many more years of exceptional keyboard performances on our “new” Steinway Concert Grand. The piano is kept in a climate controlled storage room in the community theatre, where it is available by rental agreement for use on the main stage or the adjacent Marie Fleming Hall. The piano will only be rented to, or for use by a qualified pianist. Rental is by the day, which may include one or more rehearsals/performances. Discounted fees may apply for multiple rentals. The renter shall be responsible for, and shall pay for the tuning of the piano if required, in addition to the rental fee. The renter shall only employ the technician/tuner designated by NOCCA. The renter shall be responsible and liable for any damage to the piano incurred through negligent use or malicious intent. The piano cover will not be removed until the piano has been positioned for use. The piano will not be positioned over, or partially over, any stage elevator or trap which may unexpectedly move or open, either by accident or design. The piano shall not be used in the lobby, the orchestra pit, or on any raised platform. The Piano Technician/Tuner will be booked by the theatre’s technical director. Please contact the Performing Arts Centre’s Technical Director at 250-542-9355.